These Monitor Stands Have Wheels For Portability. These Racks Like To Travel! 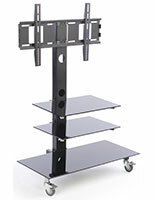 This Is Just One of Hundreds of Other Monitor Stands Available For Purchase In Our Catalog of Live Inventory! 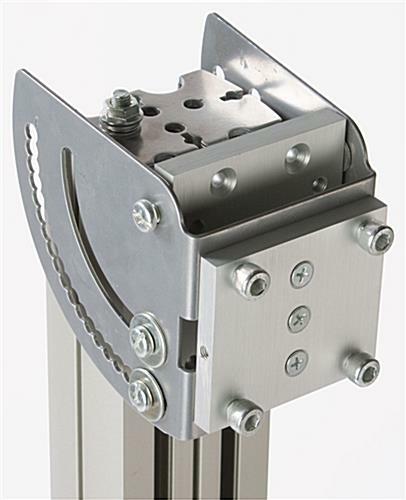 Tilt bracket can display television at better viewing angles. VESA 200 x 100 & 200 x 200 bracket holds 23" to 30" TV. These monitor stands, also known as a plasma stand and an LCD rack, can hold a 23" to 30" TV, weighing less than 50 lbs, utilizing a 200 x 100 VESA bracket. We ship all the necessary hardware to mount most televisions, however some TVs will require specific screws you can get at a local hardware store. 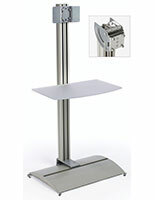 The monitor stands have a metal pocket mounted on the front to hold either brochures or magazines easily. 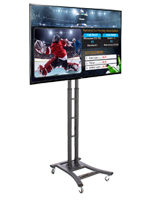 These plasma stands are ideal monitor stands for use in retail stores, business lobbies, and trade shows, as the screen display acts like a salesman, informing passersby of the benefits of your business. This LED floor mount is the top seller suited for your Vizio. 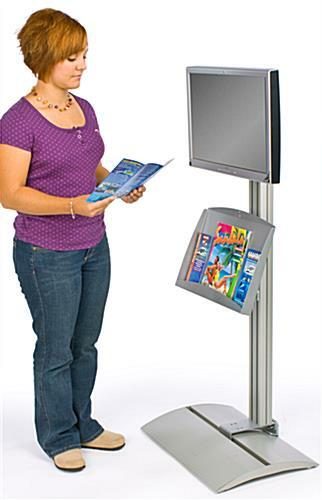 These monitor stands can mount a 26" for your informational needs, this allows customers to be drawn in and grab a pamphlet. This plasma mount is VESA compatible making it the best unit for Vizio televisions. 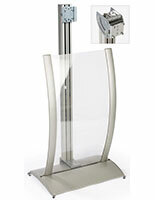 Mounting a 26" Vizio TV to this stand will captivate the attention of passersby and draw them into your display. This LED mount can be displayed in any location and will appeal to current and future customers. 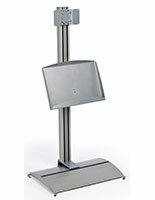 The monitor stands have an optional tilting mount available. 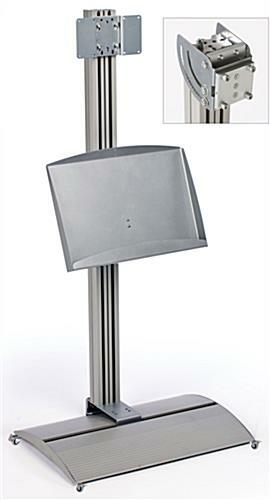 You can use this mount to tilt your television to a better viewing angle for customers and clients. Monitor stands, like a widescreen showcase and a flat panel TV stand, are made from brushed aluminum with a satin silver finish. Easily blending in with any surrounding, the flat panel showcases, monitor stands are durable enough to be used in heavily trafficked areas. We ship the monitor stands unassembled to keep shipping costs down, but it can be easily assembled in minutes. This AV stand, monitor stands combine a traditional merchandising pocket with a television to create one great promotional tool.